North Center Street in Reno, NV. Harrah's has over 900 Reno slots that you want to play, everything from traditional three-reel spinners to high-tech penny slot games with exciting bonus rounds! When you want someplace to play your favorite numbers, visit Harrah's Reno Casino for a keno experience giving you the chance to win big. 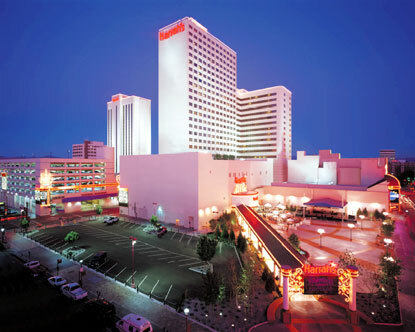 Come Out and Play the classics at Harrah's Reno Casino � blackjack, roulette, craps and more. Or, find a new favorite with innovative table game variations like Let It Ride and Three Card Poker. The electrifying world of race and sports betting is yours to explore when you get in on the fun and action you'll only find in the Race & Sports Book at Harrah's Reno Casino. Starbucks extensive menu features all your favorite hot and cold beverages, including Frappuccino, espresso, cappuccino, coffee and more. Located just off the Asian gaming area, the Joy Luck Noodle Bar features mouth-watering Asian favorites and dim sum specials, all under $10. For subs that won't sink your wallet, think toasty. Quiznos serves up oven-toasted subs on artisan bread, stuffed with premium ingredients. Twisted farm fare is served up at this restaurant notorious for portions so huge; it's been featured on Man V. Food. Carvings, the Harrah's Reno buffet is a mouth-watering feast around the world with seven stations serving up the very best in all-you-can-eat. Ichiban offers the very best in sushi, teppanyaki style cooking and traditional Japanese style favorites. The Harrah's Steak House is the first restaurant in Northern Nevada to be elected into the Fine Dining Hall of Fame. From The Spa at Harrah's to Health Club as well as a Sun Tanning Center.